ZEBEDEE (GB) (Grey 2008-Stud Ire. 2011, Aust. 2015). 6 wins at 2, Doncaster Flying Childers S., Gr.2. Three-quarter-brother to SW Citron Spirit. Sire of 402 rnrs, 224 wnrs, inc. SW Magical Memory (York Duke of York S., Gr.2), Ivawood, Barraquero, Buonasera, Dee Dee d'Or, SP Beautiful Vintage, Manaafidh, Parsley, Barbill, Charline Royale, Ghost Serge, Major Jumbo, Smokey Lane, Desilva, Sandra's Secret, North Ireland and of Two Shots of Happy, etc. His oldest Aust.-bred progeny are 2YOs. AGRESTO, by Hussonet. Placed at 2 in Aust. 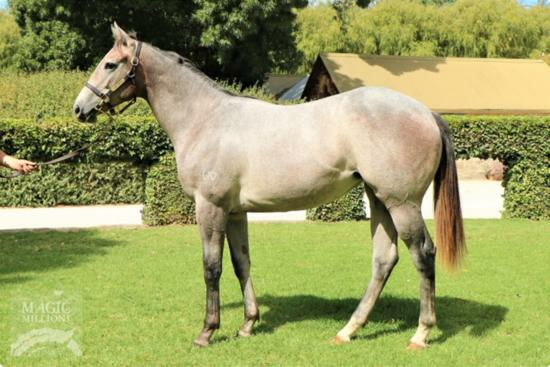 Three-quarter-sister to Steel Stilettos (dam of BOOTS 'N' ALL), half-sister to RUTHERFORD EAGLE. This is her second live foal. Dam of one foal to race. RUTHERFORD EAGLE (Favorite Trick). 5 wins from 1200m to 1600m, A$103,330, M$328,900 in Aust. and Macau, Gosford Classic, L, 2d AJC Members Welter H., STC Clubs NSW Welter H., 3d STC Schweppes Agrum H., Tooheys New Welter H.
Windbern. 2 wins at 1200m, 2000m, A$91,800, in 2016-17, MRC Laming Racing H., 3d MRC Ladbrokes Info Hub H.
Arena Salon. 7 wins to 1400m, A$133,225, to 2017-18, BRC Kanga Couriers H., Garrards Horse & Hound P., 2d BRC Mount Franklin H., SCTC Konami Gaming H., 3d BRC L&H Auslec H., Ipswich TC Channel 7 H.
Fille Champagne. 3 wins at 1200m, 1400m, A$101,310, in 2016-17, MRC Blue Star Group H.
Diago. 6 wins from 1200m to 1850m, A$157,625, BRC Winning Edge Promotional Gear H., Pete & Mary Triple One Six H., Hidden Dragon H., Qld Tatt's RC Hardy Brothers Jewellers H., 2d BRC Sky International H., Landfill Logistic H., Fujitsu H., Qld Tatt's RC Hardy Brothers Jewellers H., SCTC Contour Consulting Engineers H.
TURNITAROUND (Hard Spun). 8 wins from 1400m to 2000m, A$589,825, to 2016-17, MRC Eclipse S., Gr.3, VRC Flt Lt Peter Armytage H., Might & Power H., MRC Ladbrokes Bet Better H., VRC Straight Draw H., 2d MRC Victoria H., Gr.3, VRC Slickpix TVN Silver Bowl Final H., KA Morrison H., Hilton Nicholas H., Patrobas H., 3d MRC Moonga S., Gr.3, MVRC Antler Luggage VOBIS Gold Star, MRC Comcater H.
BOOTS 'N' ALL (Perfectly Ready). 8 wins from 1400m to 1800m, NZ$170,416, to 2017-18, CJC Timaru S., L, Otago RC White Robe Lodge H., CJC Daphne Bannan Memorial H., 2d Timaru Cup, L, CJC Garrards Horse & Hound H., Speight's H., Racecourse Hotel H., 3d CJC Coupland's Bakeries Mile H., Gr.2, Canterbury Gold Cup, Gr.3, Winning Edge Presentation H., 4th CJC Easter Cup, L.
Celebration Girl (Stratum). 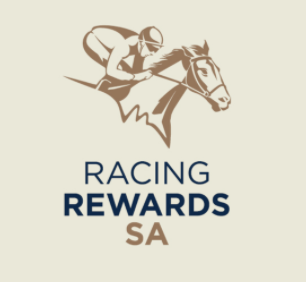 5 wins-1 at 2-at 1000m, 1100m, A$143,760, WATC Westspeed 2YO P., Racingjobs.com.au H., Perthracing.com.au H., Westspeed 3YO H., Port Bouvard Real Estate H., 2d WATC Playeronline.com.au H., St Patrick's Day H., Best of British H., James McGlew Master Stockbroker H., 3d WATC Supremacy S., L, Westspeed 3YO H., Pink Royal Flush 2YO P., Westspeed 3YO H.